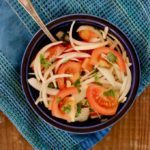 Ensalada chilena (Chilean Salad) is a very traditional Chilean salad that is prepared with very thinly sliced onion, tomato wedges, and cilantro. It is often served on grilled meats, fish or humitas. Peel the tomatoes. You can peel them more easily by immersing them in hot water for a minute. Thinly cut the onion. Immerse in hot water for 5 minutes, then drain. Add the onion to the tomatoes and sprinkle with chopped cilantro. Spray a little olive oil, sprinkle salt and crushed black pepper.